so you get "drive" from both rear wheels. Large 13 inch tall off road tires. All steel frame. Steel wheels Contoured seat. This go kart is rugged and built to last. For riders 13 and up. arrives fully assembled except for the roll bar. This item usually ships 1-3 business days from order placement. Tracking will be sent to you via email when shipped. Ships Freight. Brake: Rear. Foot operated Hydraulic Vented Disc. 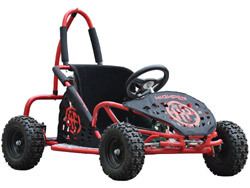 Click the button below to add the MotoTec 79cc Off Road Gas Go Kart to your wish list.